Since June is the month we celebrate our fathers, we wanted to share some tips from a recent study by the Academy of General Dentistry (AGD) that shows men are generally less likely to take care of their oral health needs than women. The AGD cited several studies that suggest men are more inclined to visit a dentist only when a problem arises. 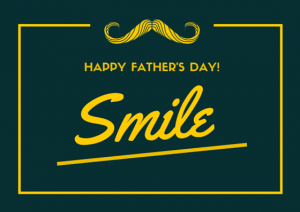 But since preventative care is crucial, they put together a list of some tips that men can take to make sure they have a healthy set of teeth for many Father’s Days to come. 1 .Visit the Dentist! It’s only twice a year and it’s painless. The American Dental Association (ADA) recommends a thorough cleaning every six months. For high-risk patients like those who smoke or have diabetes, you might benefit from more frequent cleanings to prevent gum disease. 2. Brush. Floss. Rinse. Repeat. The ADA recommends that men should brush their teeth at least twice a day for two minutes and floss at least once day. Consider rinsing with an alcohol-free mouthwash before bed for a fresher mouth when you wake up. 4. Stop Smoking. Men who smoke cigarettes or use chewing tobacco are much more prone to gum disease, tooth decay, and even oral cancer. 5. Take any medications? Drink up! Men who take medications for any number of health reasons are at a higher risk for dry mouth which can decreases their salivary flow and increases the risk for cavities. Drink plenty of water throughout the day and limit your consumption of sugary drinks and salty foods.